The headquarters of Smart City Solutions (SCS) at Crown and Albert Streets, Queenstown. At least 60 parking meter workers are being laid off following the Guyana government’s suspension of the parking meter by-laws for 90 days, prompting concerns about the employment contract. The workers were sacked one day after the Minister of Communities, Ronald Bulkan suspended the parking meter by-laws for three months to allow for the renegotiation of the contract between SCS and City Hall to address concerns by the public and the government. A number of workers have already signed a document agreeing to the termination of their services and the payment of all outstanding monies. “Please be advised that you will be receiving all wages and payments due to you up until the end of your employment,” Gochez added. The parking wardens were being paid GYD$90,000 monthly. Other workers are said to be mulling taking their grievance to the Ministry of Social Protection’s Department of Labour. When Demerara Waves visited SCS’ headquarters at Crown and Albert Streets, Queenstown, Georgetown no one was was there to speak with the media. 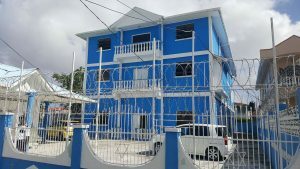 That building had housed the election campaign headquarters of the APNU+AFC coalition. The sacking of the workers has resulted in the disclosure of the employment contract that states, among other things, that while they are required to work 40 hours per week, they may be required to perform out unspecified duties and work overtime without extra pay. “The employee may be required to work hours outside normal hours of employment and in excess of 40 hours per week as the employer considers necessary to meet the needs of the business and there shall be no requirement of any further compensation, provided that the employer may elect to provide any amount of further compensation at the complete discretion of the employer,” the agreement sates. The employment contract, which lasts from February 1, 2017 to January 31, 2018, provides for an initial probationary period of three months with the possibility of extension by another three months. In a letter to Minister of Communities Bulkan, the Town Clerk had warned that the workers would have been laid off if the parking meter contract was suspended. A separate confidentiality agreement requires workers to “irrevocably waive all right to a trial by jury in any action, proceeding or counterclaim arising out of or relating to this agreement.” Employees have also agreed not disclose any of SCS or its affiliates’ business dealings and to resist the disclosure until an appropriate protective order may be sought and/or a waiver of compliance with the provisions of this agreement is granted.” Workers have also bound themselves to non-disclosure of any of SCS’ information for five years even after they would have ended their relationship with the company.